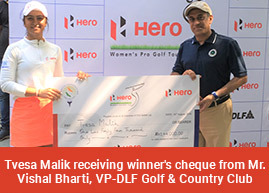 Greater NOIDA, September 6: Amandeep Drall was back in the familiar position at the top of the leaderboard in the second round of the 13th leg of the Hero Women’s Pro Golf Tour on Thursday. The Kapurthala golfer, who has been in sizzling form made amends for her first round 75 with the first and only sub-par round of the tournament so far by carding one-under 71. At 2-over 146, she had built up a handy four-shot lead over Afshan Fatima, her closest rival, who shot a second successive 75. Overnight leader amateur Tanirika Singh had a nightmarish three bogeys in a row right at the end on the last three holes. Her second round of 78 saw her total 7-over 141 and she was Tied-3rd with Gursimar Badwal (75) at 151. Amandeep Drall birdied the second and fifth and turned in two-under with no bogeys. On the back nine, she added a birdie on par-4 11th and was 3-under. She suffered back-to-back bogeys on 14th and 15th, but survived that well enough to hold a 4-shot lead. Afshan Fatima was 4-over after 10 holes, but made a great recovery with birdies on 13th, 16th and 17th besides a double on 15th. Her card of 75 saw her hold the sole second position after being Tied-2nd overnight. Sidhi Kapoor carded a second straight 76 and is now sole fifth, one place ahead of Tvesa Malik (76-77), who had a tough start with a bogey-double bogey on first two holes. She had two other doubles on a forgettable day for her. At 153, she is seven shots behind the leader, Amandeep. Error! Filename not specified. Ayesha Kapur (76) and Gaurika Bishnoi (77) were tied-7th at 155, while Anisha Padukone (76) was lying ninth and Suchitra Ramesh (77) rounded off the Top-10 at 157. In the third and final round on Friday, Neha Tripathi, who is having a very rough week, will play in the first two-ball with Mehar Atwal, while the next two-ball will see Khushi Khanijau and amateur Khushi Hooda. The third group features Millie Saroha, amateur Rhea Sarvanan and Suchitra Ramesh, while the fourth group has Anisha Padukone, Gaurika Bishnoi and Ayesha Kapur. The penultimate group has Tvesa Malik, Siddhi Kapoor and amateur Tanirika Singh and the lead group comprises Gursimar Badwal, Afshan Fatima and Amandeep Drall.